Daniel’s final vision concludes with a vision of the final judgement in which all people, living and dead, will be judged by God. This message contains symbols that are still debated today. What do the days mean? What is the abomination of desolation? What does it mean for us today? In Daniel 10, Daniel encounters Jesus in a vision. Daniel is overwhelmed by this experience, yet Jesus blesses and encourages Daniel. In this sermon we look at what it means to fear God and what it means to encounter God in ways that overwhelm us. Daniel sees some incredibly accurate and powerful visions in chapter 8. These visions reveal a dark future for Israel, but hope that God will ultimately prevail and redeem the Israelites. How do we reconcile the power and knowledge of God with the reality of living in a broken world? 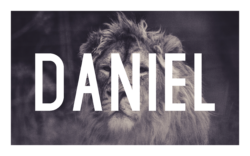 The book of Daniel is one of the Old Testament books that most strongly points forward to Jesus. In this sermon we look at a prophecy concerning Jesus that is well connected to several New Testament passages which confirm the predictions of Daniel.